LAWRENCE, Kan. (AP) — Bill Self and his coaching staff have been recruiting for more than a year while the specter of a widespread investigation into college basketball has loomed over the storied Kansas program. They’ve sat in gyms for AAU tournaments and watched the next generation of stars as they showcase their talent for coaches just like them. The hours they’ve spent on the road have been eclipsed only by those spent on the telephone as they try to land the next five-star stud. 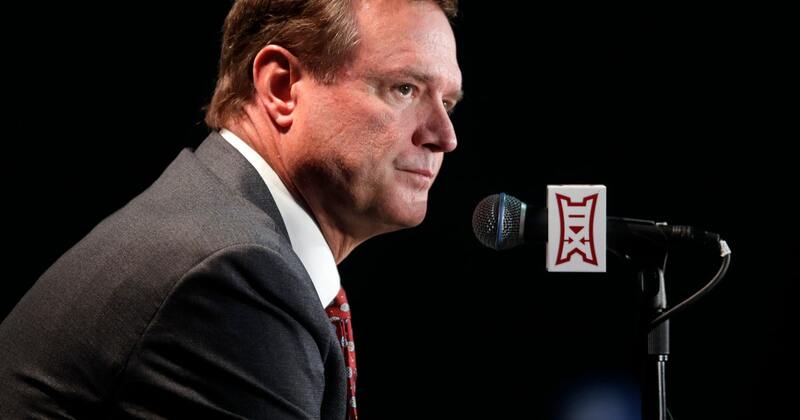 Soon, Self will be making in-home visits to prospects considering the top-ranked Jayhawks, and inevitably he will be asked about his role in the corruption scandal engulfing the sport. What will the Hall of Fame coach tell the kid? What will he tell mom and dad? Indeed, the path forward promises to be a bumpy one for Self and the Jayhawks, who are so loaded with talent this season they were picked No. 1 in the AP’s preseason poll and are the runaway choice of the Big 12’s coaches to win their 15th consecutive conference crown. In a New York courtroom this week, former Adidas executive Jim Gatto, consultant Merl Code and NBA agent runner Christian Dawkins were found guilty of conspiracy to commit wire fraud after they were linked to a pay-for-play scheme in which they would funnel money from Adidas to families of recruits at Kansas, Louisville and its other sponsored schools. During testimony, text messages presented by the defense indicated Self and Kansas assistant Kurtis Townsend may have been aware that ex-AAU coach T.J. Gassnola had helped to deliver money to the legal guardian of one of their current players, sophomore forward Silvio De Sousa. Gassnola denied that Self or any assistants knew of the payments, and the school said Wednesday that it would withhold De Sousa from competition until an eligibility review is complete. Nevertheless, it was a black eye for a coach and program that prides itself on transparency. The investigation could hover for a while, though. There are two more federal cases pending next year, and the three men found guilty Wednesday also will be sentenced in the spring. In the meantime, Self said the school and NCAA will work together to determine whether De Sousa is eligible to play this season. He was to be held out of Thursday night’s exhibition opener against Emporia State but Self would not speculate beyond that. Kansas opens the regular season against Michigan State on Nov. 6 in Indianapolis. Self said he doesn’t think that the investigation will be a distraction for a team with legitimate NCAA title aspirations. Yes, they lost backcourt stars Devonte Graham, Malik Newman and Svi Mykhailiuk to the NBA, but they supplement a returning core highlight by big man Udoka Azubuike with a trio of high-level transfers — Dedric and K.J. Lawson from Memphis and Charlie Moore from California — along with one of the nation’s top recruiting classes. “When you’re in the eye, you don’t really feel as much of what’s going on outside of it,” Self said. “I think that’s more common for young people than adults. I think as adults we internalize all aspects of what’s going on. Players may know of it and feel it a little bit, but they’re worried about how to compete against this program or scouting report or what’s happening in the personal lives. Might it be an excuse on the recruiting trail? Self said that’s a hard question to answer. “There are so many things in recruiting that are sometimes said that just because it’s said or rumored, you don’t cease to recruit someone,” he said. “You could investigate it or whatever the case. There are a lot of ploys in recruiting, there are a lot of things that can throw off the scent. There are a lot of things that can be said or thought to be true that are totally different.